This project provides opportunities for two ‘Buddies’ to partner with each other through TFCM to sponsor the schooling of two children from the same needy family where the guardian is struggling to meet the basic needs of the children, and where funding of schooling is pushed down the priority list. The sponsoring ‘Buddies’ could be two members of your family, or two close friends. The sponsored 'Buddies' start their schooling at the same time as each other and ‘buddy up’ to support and encourage each other at school, even though they may start in different classes. That said, we do have quite a lot of families with twins who would start in the same class together... like these two! 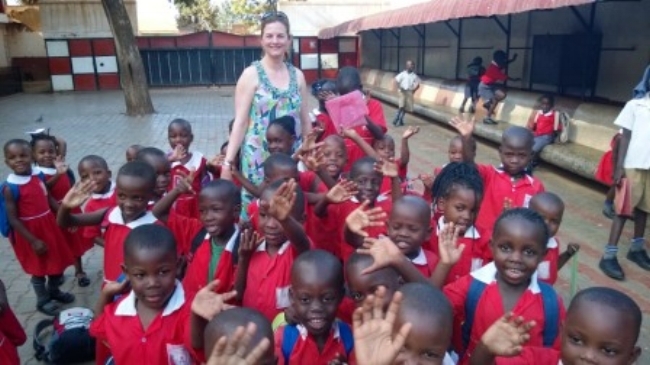 The Buddy Builders Club is all about two people who care, connecting with a family in need in Uganda, for whom hope has to look like something tangible... and which brings encouragement and a foundation for a better future into their lives. When new ‘Buddies’ join the Club we share the family situation with them. We then keep them updated on the progress of the children at school and any TFCM support activities in which the guardian is involved. TFCM promotes the Buddy Builders Club (BBC) as the preferred option for child sponsorship, but sponsors for schooling of a single child are also needed and always welcomed. TFCM promotes and supports schooling for children in two of the three locations in which we operate. In Kawempe we partner with 3 separate schools offering education from Nursery and Primary level through to secondary leaving stage. In Kalagi we have our own school which currently provides nursery and primary education only. Graduation Day at our school in Kalagi...as pupils celebrate leaving Nursery Top Class to start in the Primary School! All the children sponsored for schooling in both locations are from the poorest extended families living in the area, or are orphans cared for in the Children’s House in Kalagi. daily hot meal and drinks.